While many of the top European teams will be heading for a winter break after this weekends round of matches, those in England will be heading into their busiest period of the season. This weekends games will be followed by the boxing day, next weekends and New Years fixtures. Squads will be tested and it is this period that will see the league table really begin to take shape. Come January and we can expect the league to truly become a two horse race, with Arsenal and Manchester United fighting for the title in May. United’s slow start to the season, where they failed to win any of their first 3 matches, is well and truly behind them. They now trail Arsenal by only a single point, have safely progressed through a difficult Champions League group, with 5 wins and a draw, and have beaten both Chelsea and Liverpool, as well as drawing with Arsenal, who needed a late goal to rescue a point. With Ronaldo still the driving force of last season, the Tevez and Rooney partnership getting better each week, Giggs still leading from the front, and new boys Nani, Anderson and Hargreaves settling in nicely, United are looking very strong this season, and have a squad that can cope with injury and loss and form, and that should see them in a strong position come May, this season could be very fruitful for the Red Devils. Arsenals young stars have caught everyone by surprise, by coping with the loss of Thierry Henry by blazing out in front, playing an attractive style of football that has managed to marry entertainment with results, something they failed to do last season, even with Henry. Cesc Fabregas has become the new leader of this young team, a role that he could fulfill for many years to come, and a role that could end with him being Arsenals greatest ever player. What Arsenal do lack however is experience, particularly in depth. So it could be a year or two too soon for them to maintain a sustained title challenge, particularly when they are still involved in Europe. However they have maintained their form for the first half of the season, and they will feel there is no reason why they wont be able to replicate this run in the crunch part of the year. So long as the poison that is Jens Lehmann does not harm team spirit within the camp, Arsenal could be giving their brand of football the perfect acknowledgment this May – a Premier League trophy. Chelsea have had a rocky season thus far, and that could lead to the type of inconstancy that will end up with them being satisfied with a Champions League place and not a title challenge. What they will fear is that this season is the beginning of the end for their brief period of dominance and not the transition that they hope it is. The arrogance and cockiness of Jose Mourinho’s period in charge is being diluted by a identity crisis within the camp. The team is stuck between the steely resolve of Mourinho’s team, and wanting to be Arsenal, owner Abromovich’s wish. Convincing wins over high flying Manchester City and struggling teams have been nullified by loses and poor performances against title challengers and rivals Manchester United and Arsenal. When Terry doesn’t play, and that’s becoming more and more frequent this season, Chelsea look vulnerable at the back and lack in leadership. Lampard has not been the player of seasons past, and fleeting performances not withstanding, is not going turn draws in wins and loses into draws, feats he used perform when Chelsea were going well. The Chelsea dream may be bursting this season. Liverpool have been Liverpool once again this season. Changes in personal have not helped them find the consistency that is needed to sustain a long championship challenge. This has been in no small part due to the too frequent rotation policy of manager Benitez. 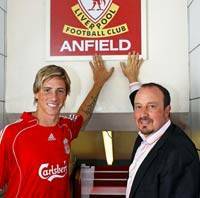 They brought in Fernando Torres for big money from Spain and in the first few weeks he showed that he was every bit as good as his Spanish reputation. Manchester United, Chelsea and Arsenal must have been kicking themselves for allowing a player of that quality to go to Liverpool. Yet instead of playing him every week Liverpool have rotated him as they would other squad players. A big mistake that may cost Benitez his job. Liverpool, for all their talk and self hype are still no closer to ending their 18 season wait for another league title. The busy period in English football will end up with the league table showing no real positional changes at the top, Arsenal and United will still be top, something that wont change for the rest of the season. The title race is well and truly a two horse race. The fate of Liverpools season rests on their next two games, and tightly linked to this is the job of manager Rafa Benitez. Liverpool need a win tonight against Marseilles in France to progress to the knockout stage of the Champions League, and a result on Sunday, when they host Manchester United, to stay on the tails of Arsenal, United and Chelsea. The idea that their season could be all but over before Christmas, if results go against them this week, is one that Liverpool should be well used to, in the league anyway, but is not what Liverpool feel they deserve. However if they are to step up to be actual challengers to Arsenal, United and Chelsea, something that only those who follow Liverpool already think they are, they need to improve on pitch performances. So far they have talked the talk but failed to walk the walk. The nature of the English Premier League means that on any given day any team can beat any team. This is born out when you look at the games lost by the top teams in recent weeks, United lost to a Bolton side in bottom 3, Arsenal to a Middlesbrough team faring little bitter, and Liverpool to Reading. However the nature of the losses is something to take notice of. United and Arsenal both at off days against teams that were prepared and drilled for the battle. 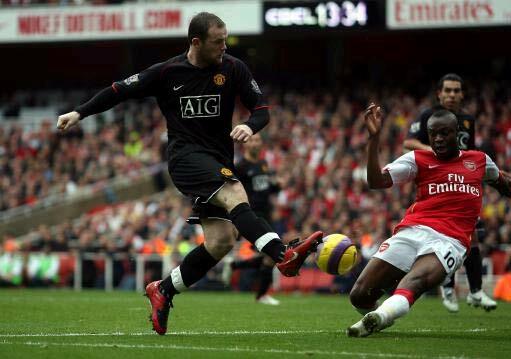 Both United and Arsenal were beaten on the day but kept trying to rescue themselves until the final whistle had blown. Liverpool did not show this fight. They had all but given up by the 70th minute, when their three best players, Gerrard, Torres and Caragher, where all taken off. 3-1 down with 20 minutes to play and they had thrown in the towel. Hardly what is expected of a title challenger. With Rafa taking his feud with the Liverpool owners into the public he will have very little board room support should Liverpool lose either match, and could find himself out of a job if they fail in both games. He has had time and money and has failed to take Liverpool anywhere near a league title. This season will be their 17th in a row without winning the league. Rafa may not be around to see them in their 18th. You are currently browsing the My Sports Blog blog archives for December, 2007.